Have you noticed something about Italy? Everything that they sell to the world has an exotic tag attached to it. Think about it. Prosciutto, love it. Ferrari, love it. Armani, love it. Ducati, love most of it. Everything from the country seems special somehow, their automobiles especially. And Moto Guzzi is no different. 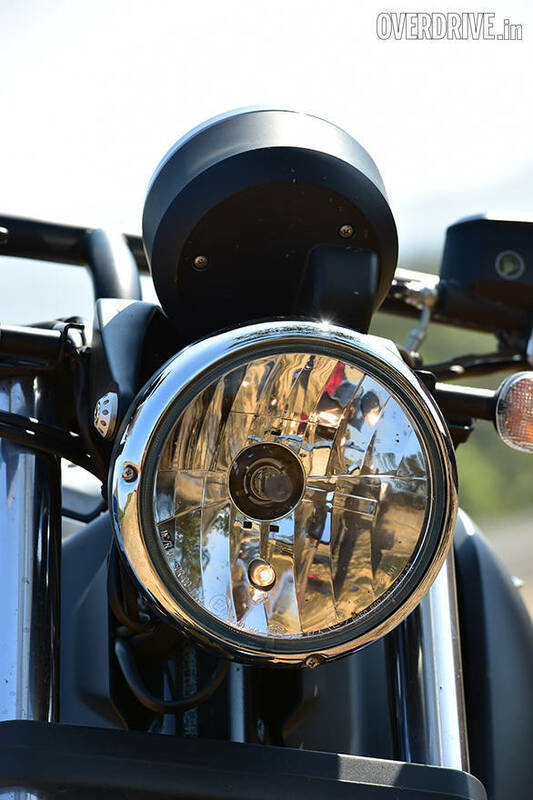 With history that dates well back to the 1920s, it is one of the brands that have been looked at with a lot of respect in motorcycling spheres. Among other things, the Italian company has been credited with building the first motorcycle wind tunnel that can test 1:1 prototypes and even making a race motorcycle with a 500cc, V8 engine that was said to be able to do 280kmph. But that's all in the past. 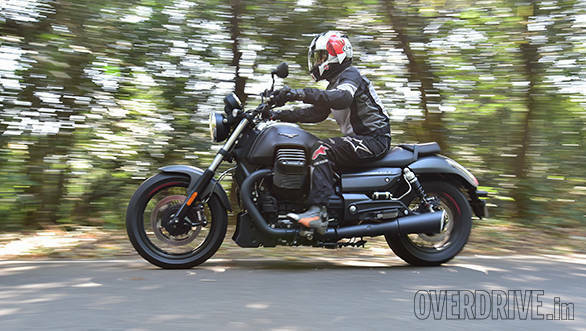 Moto Guzzi now makes seven motorcycle with several sub variants within them. Among them is the California, which the Audace is an evolution of. It was first unveiled at EICMA in 2014 and while it used the same powertrain as the California, it was meant to be leaner and meaner. As I said before, the Audace was designed to be a leaner and meaner derivative of the California. The matte black treatment to the engine and other bits (it also comes with a matte orange tank, in case you were wondering) are a hint in this direction. 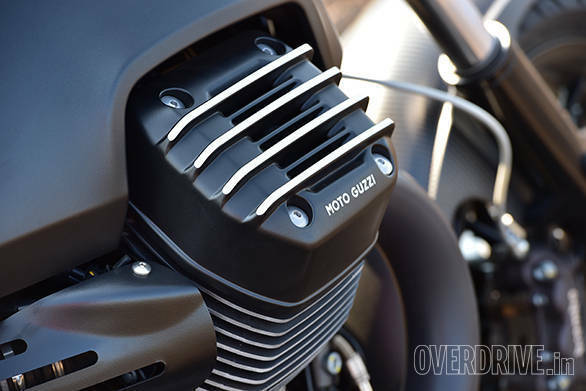 But as with all other Guzzis, the most prominent design feature on the bike is the big, transverse, V-twin with those cylinder heads sticking out the side. It is a lovely looking bike with a sense of exotic-ness about it. And if you were to ride one among many other imported motorcycles, it is sure to get you a lot of attention. This from experience. At heart though, this motorcycle is a cruiser. And not just any regular cruiser. 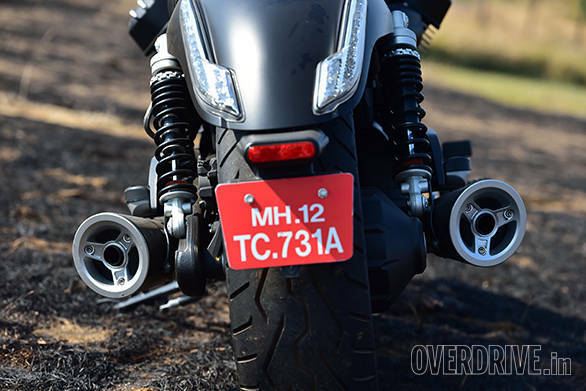 Moto Guzzi is very clear about the custom and muscle tags that have been lent to this bike. And like every other cruiser that comes with those tags attached (the H-D Breakout for example), it sacrifices a bit of comfort in favour of looks. So the Audace gets thick drag handlebars and trades in the California's foot boards for foot pegs. The pegs and 'bars make it a bit of a stretch for shorter riders and the leaned forward riding position can get a bit taxing on your back muscles over long distances. 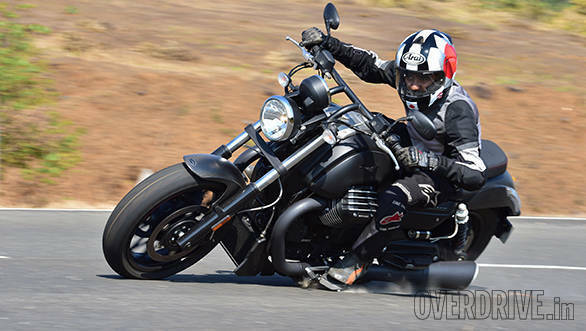 But if you do intend to go long distances with this motorcycle, which you can thanks to the 20.5-litre tank, be sure that your backside will be real happy. The Audace's seat is like a sofa. It is wide and plush, making it super comfortable over long distances. I rode the bike for close to 500km and the only complaints I had were that the 'bars were a stretch and the clutch was heavy. But more on that later. First, the numbers. 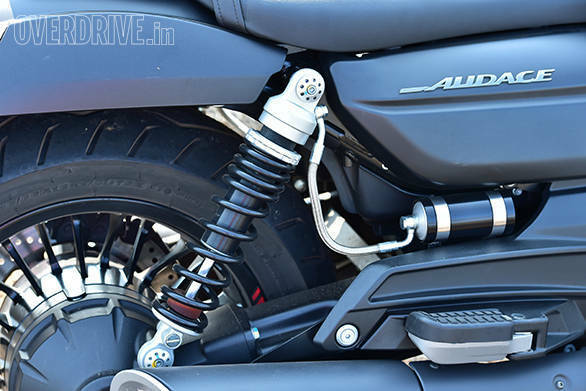 The Audace uses a 1380cc, transverse mounted, V-twin motor that makes 97PS and 121Nm of torque. Being a transverse mounted engine, the first time you crank it up, you do feel strange. 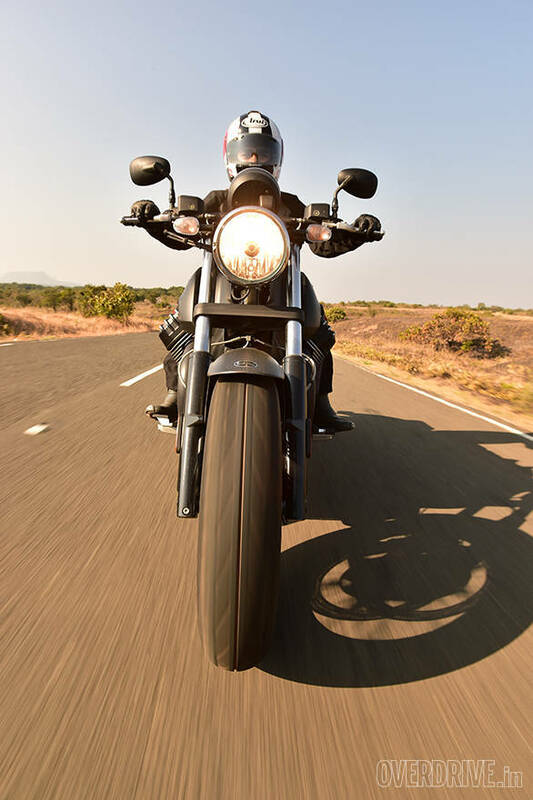 Like all motorcycles with their engines running across the chassis instead of being in line with, the Audace too tends to lean to the right side every time you open the throttle at stand still or when the gears aren't engaged. This is because the crank rotation is along the left-right axis instead of front-back. 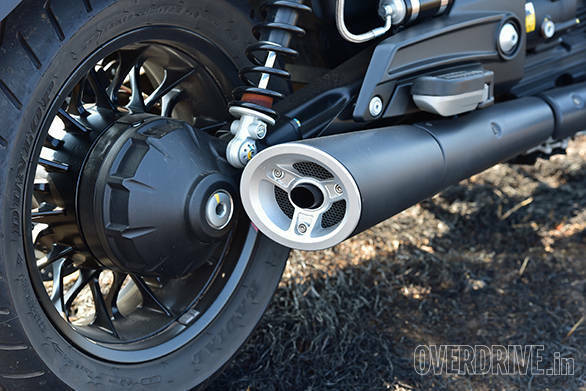 But thanks to Moto Guzzi's CARC (compact reactive drive) the effects of this aren't transferred to the motorcycle when you ride. All you will notice is the smoothness of the motor and the amount of tractable power it delivers. At idle, the Audace makes you feel like you're sitting atop a diesel motor. I'd even venture as far as saying it is a bit worse than a Harley at idle. But the moment you open gas, the motorcycle becomes dead still. This calm disposition is carried over in the way it delivers power too. Like a lot of other V-twins, letting go of the clutch isn't met with violence. There is lots of torque available right from idle, but it doesn't arrive with a jerk. And once you do get going, progress is quick. In fact, we managed to clock 4.1 seconds to hit 100kmph (which is super impressive for something that weighs over 300kg) and a top speed of 187kmph with scope for more if you're willing to battle the windblast. There is strong acceleration through the gears and it pulls cleanly from low RPMs except in the highest two gears. From 40kmph, there was some knocking from the motor especially in sixth gear, but then again, that's nitpicking. That said, what I did find missing from the motor was that sense of kick in the pants acceleration that you might be familiar with from the Indians and Harleys. The quickness is there, but the acceleration doesn't really make your eyes go wide. It's all too calm, despite the streak of blue smoke you're leaving behind. What I didn't like one bit, though, was how heavy the clutch was. The hydraulic clutch is quite painful to use in city traffic. Within a few minutes your fingers will start aching. So if you're getting this motorcycle as an everyday ride, then I hope you have really strong fingers or a relatively traffic free commute. 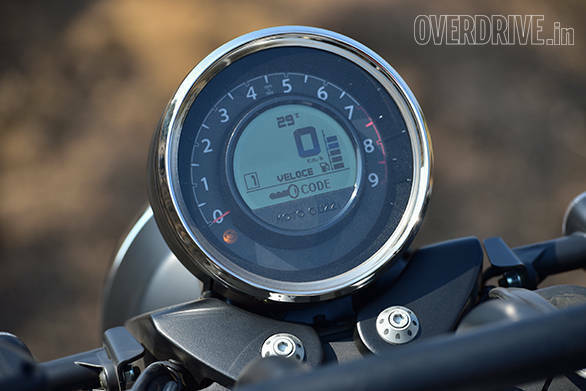 Like most other bikes from Piaggio, the Audace too gets a whole bunch of electronics to keep it well behaved. It gets ride-by-wire which enabled engineers to give the Audace three power modes and three-step traction control. The three power modes that you can choose from are Veloce, Turismo and Pioggia. 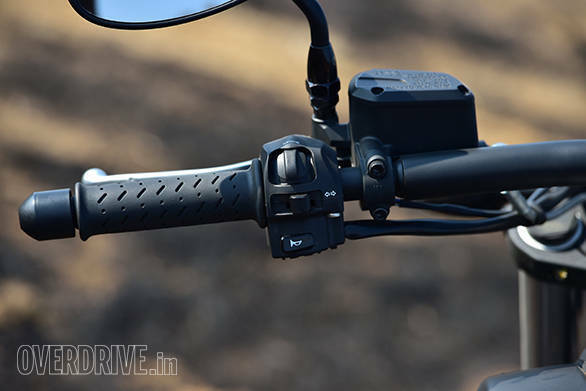 The difference between the modes are throttle sensitivity, peak power and engine braking. Veloce gives a sensitive throttle (you might even call it too sensitive) with full power and full engine braking. Turismo gives you full power but a more gentle throttle map and less engine braking (by means of a residual spray of fuel when you let go of the throttle). Pioggia is a safe mode with restricted peak power, a gentle throttle map and very little engine braking  a sort of 'rain' mode. My favourite bit from among all the electronics, though, has to be the traction control. You can set it to four modes  Three, Two, One and Off, with three being the highest amount of intervention and Off being, well, off. 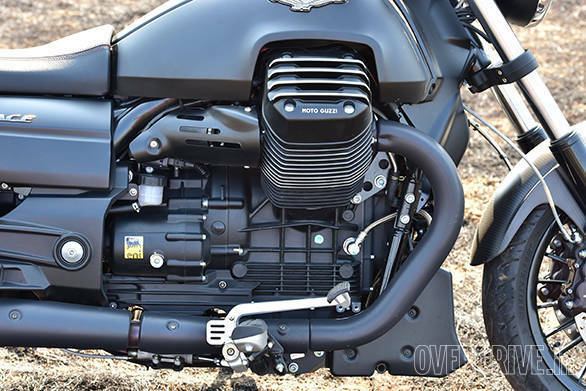 The wonderful thing about the Moto Guzzi TC is that you can almost never tell that it is working. When accelerating hard out of corners and when tipped over into corners at high speeds, the only sign that the electronics are at work is that flashing light on the console. There is no jerkiness or sudden loss of power. The system is quite seamless. 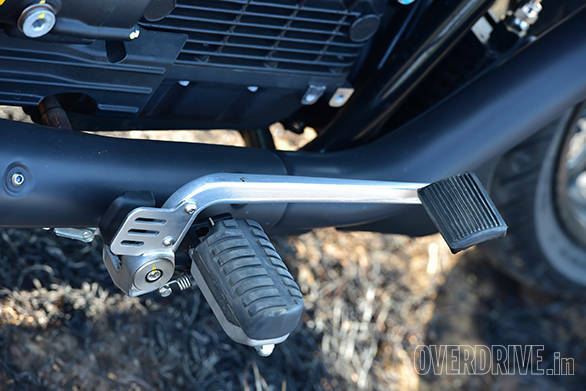 In fact, the only time you can actually feel it a little bit is when riding over gravel or over wet/oily patches. Built on a double cradle frame, the Audace uses a conventional Sachs fork up front and two hydraulic shock absorbers (again from Sachs) at the rear. There isn't much in terms of adjustability and the only thing you can do is change the preload at the rear. 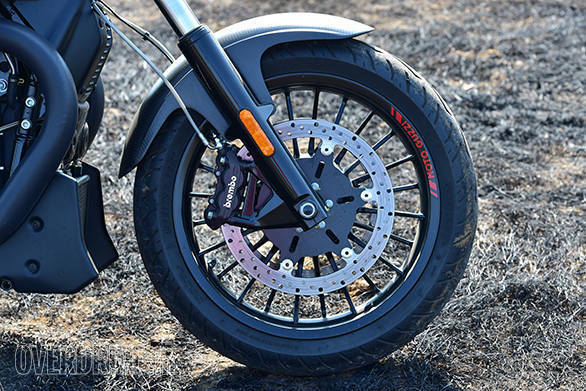 There is no way around the fact that the Audace is a stiffly sprung motorcycle. But thankfully, that does not mean that the ride quality is back breaking. 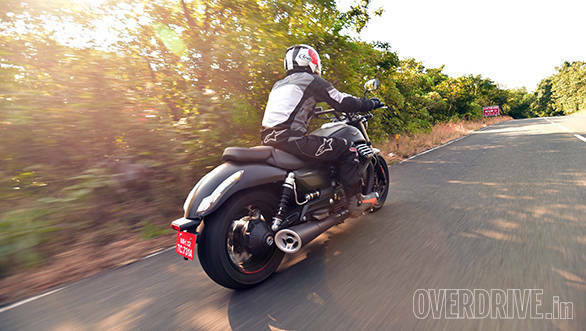 In fact, it handles pretty much everything Indian roads can throw at it... with poise. Having limited travel at the rear though does make things harsh over the worst bumps. Then again, that is only over the worst, and everything else is dismissed quite easily. 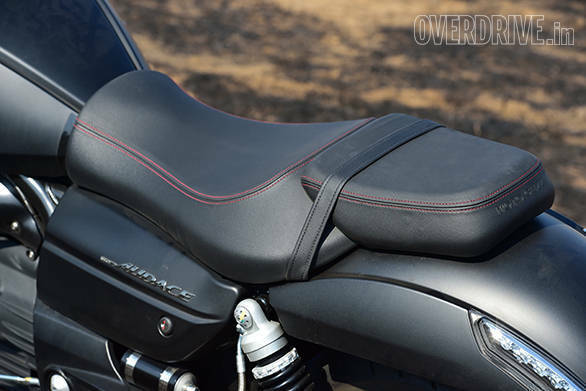 So if you were to ride long distances out on the highways, the cozy seat and stiff setup would agree with you. But if bad roads are part of the plan, progress will be really slow. Where the stiff setup does shine, is in the way the Audace corners. Once tipped into corners, it holds its line beautifully. There is no wallowing and the front end gives you lots of feedback that is really confidence inspiring once you start throwing it around. But there is a glitch. Being a 300kg motorcycle (weight with all fluids, no fuel) with a wheelbase of 1,685mm and a fairly long trail, it isn't very light on its feet. It takes a lot of effort to get the bike to change direction. But once you do get it to point the way you want it to go, it shows remarkable stability through the corner. You can really push the Audace and the bike has the ability to carry impressive lean angles before the feeler bolts on the foot pegs start grinding. I managed to grind away a fair bit of them and the sticky Dunlop rubber and stability only urge you to do it more once you've gotten past the effort the entire exercise takes. Especially considering how good the brakes and dual channel ABS are at bringing you to a stop in a hurry. 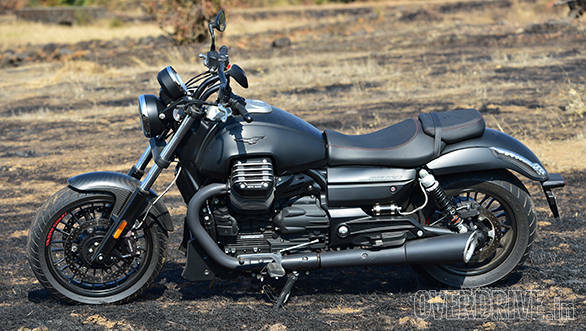 The Moto Guzzi Audace is a great motorcycle. It does pretty much everything well. It looks great, has a great motor, handles quite well and comes loaded with a lot of electronics. And with an overall fuel efficiency of 14.4kmpl, it isn't too bad either (within the segment). 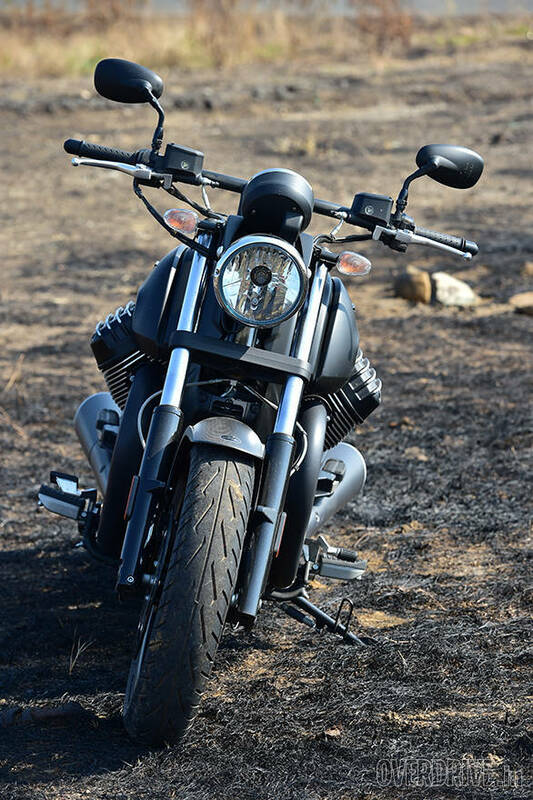 If you want a cruiser that will help you stand out from among your Harley and Indian riding friends, then this might be the bike for you. But my problem with this motorcycle was that over the hundreds of kilometres that I rode this bike over, I just could not form an emotional connect with it. It did everything well, but that's all it did. It never made me go wow the way a lot of things from Italy always have. There is also another factor to be kept in mind. 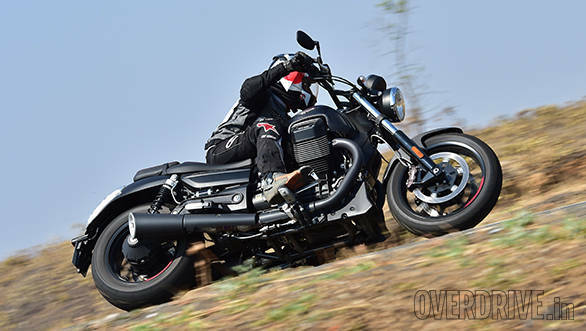 As a CBU, the Audace will cost you Rs 19.94 lakh (ex-Pune). But if you want one, you will have to buy it from the only Piaggio MotoPlex in Pune from where their CBU motorcycles are sold. If you aren't from Pune, you will have to figure out service. Piaggio will send a trained technician to service your bike wherever you are, but you will have to pay for his transport. Seems like a lot of effort than walking into the many Harley service stations. Then there is the question of competition. 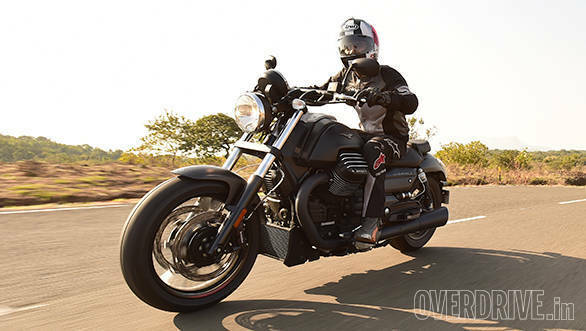 If you're in the market for a motorcycle like this, I also suggest you take a look at some of the other motorcycles in the segment, especially the Indian Chief Dark Horse (it comes in the same matte black too). Or you could just wait till we ride them both in a comparison for you.